Population surveyed: California registered voters. Number of interviews: 1,555 interviews completed, including augmented samples of Asian American voters. Method of data collection: Random samples of registered voters sampled by cell and landline telephone using live interviewers. Languages of administration: English, Spanish, Cantonese, Mandarin, Tagalog, Korean, Vietnamese and Hindi. Sampling error: Overall findings have a sampling error of +/- 2.6 percentage points at the 95% confidence level. Updating California voter views of the Affordable Care Act. Importance of Medi-Cal to voters and their families. Is the program successful in meeting its goals? Should Medi-Cal be expanded to cover the undocumented? Has the state been successful in implementing the ACA and in establishing Covered California? Satisfaction with the way the overall health care system is working in California. How have opinions changed over time? Challenges still facing the state with regard to health care affordability. Voter views about other new policies being discussed in the state. 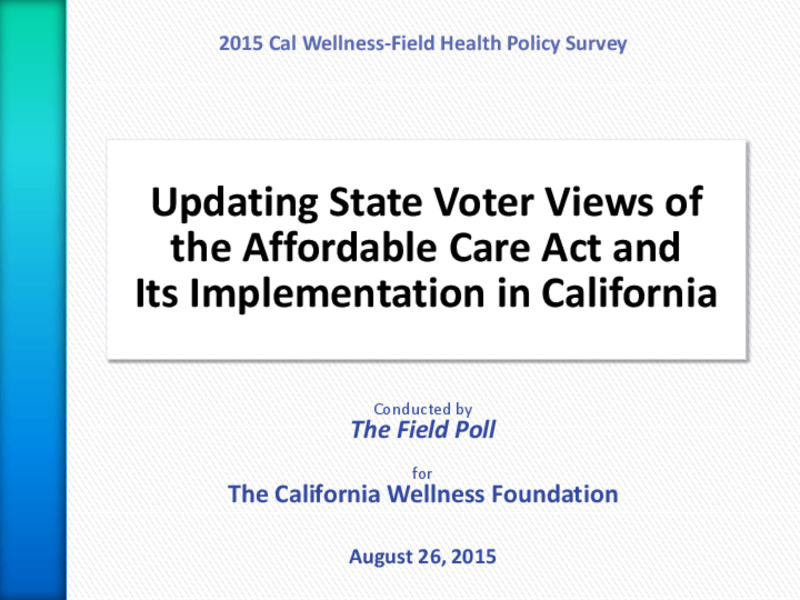 Copyright 2015 California Wellness Foundation, Field Poll.